I think it is so normal that you want to 'run away from life' especially since you have been responsible your entire adult life. How healthy that you are asking yourself all of these questions, are unsure of where you are and where you want to go. My vote is to go with the wind! Some day you will look back and be thankful for this growth period, even though now there is a lot of pain and self doubt. I look forward to meeting you at Art & Soul! This post really resonated with me. I feel like I just want to walk away from all the day to day responsibilities and run wild in the world. I love my husband, puppies and the house but I want to just pack them all up and head out to see what's out there that doesn't involve a mortgage, cable bills, wireframes or meetings "with the agency". I think this is one reason I'm constantly planning the next vacation. :) It's amazing how your journey is really connecting people and that you seem to embrace all that the world has to offer. Can't wait to see where your ship takes you. Hi there my friend! I've been thinking about you. You deserve to take care of yourself & enjoy life. It was something I had to work on because I felt so guilty taking time out for myself. I think I'm a better mom & wife because I have my me time. Things always seem to work out & I have no doubt that the will for you. Being at a crossroads is never easy, is it ? Especially when you arrive there with lots of grief and guilt baggage on your back. My circumstances are very different from yours and yet, I find myself at a similar place, carrying comparable burdens. I say I feel like a dreamer without a dream. How do I find my way ? Maybe like you, I will try giving up the road and its burdens, and head out to sea...and let those winds carry me for awhile...Maybe I will see you out there ! 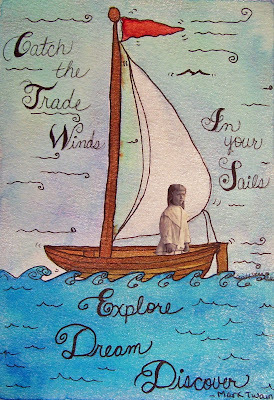 May your Sails be full! I could have written almost the same words myself Cindy. Even when I remind myself that I am in a much better place than I was last year at this time, I am still restless and I don't know how to answer the questions of what I really really want. And give myself permission, once that question is answered, to just go for it. It's uncomfortable. I am sure your search will yield what you are looking for, but it's not without angst, is it?